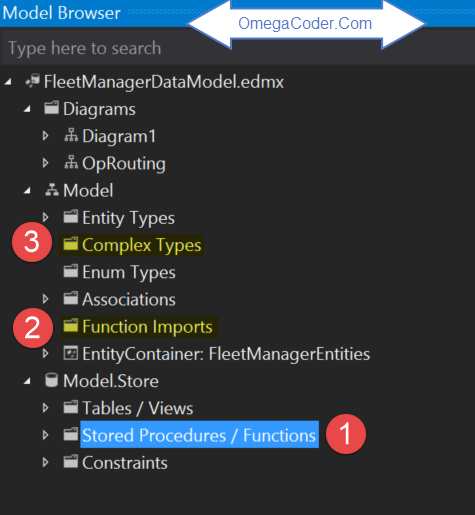 This is a how-to on getting Entity Framework (EF) version 5 and 6 to include stored procs and how to consume the resulting entities in code. 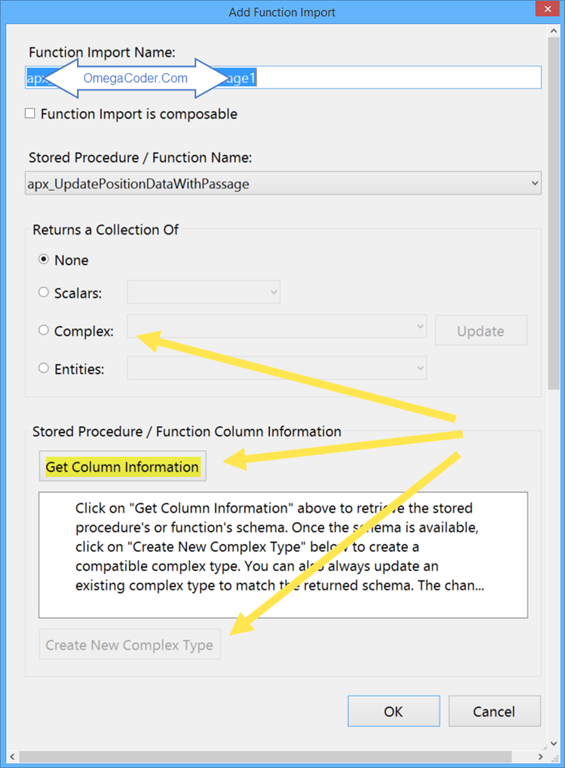 In the EF designer choose Update Model From Database. 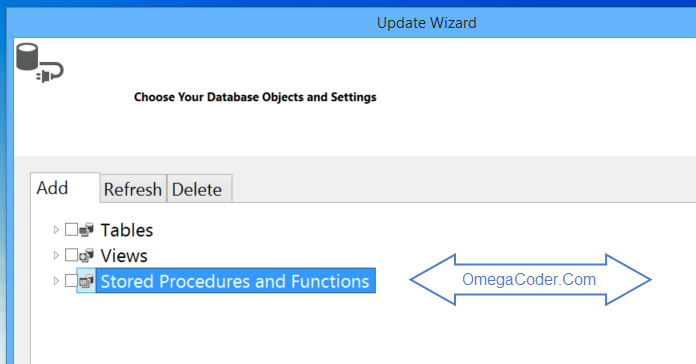 When the page to Choose Your Database Objects and Settings comes up which allows one to add new tables/views/stored procs, select the stored proc of interest. Remember the name for the resulting data mapping entity will be the name with the extension _Result. Once the wizard is finished EF will contain the stored proc in the Model Browser. The model browser can be displayed by right clicking the EF design surface and selecting Model Browser. Here is an explanation of what has happened. (1) You have added the stored proc into the Stored Procedures / Functions as an item of interest. (2) EF has created a function import of the stored proc and placed it into Function Imports. 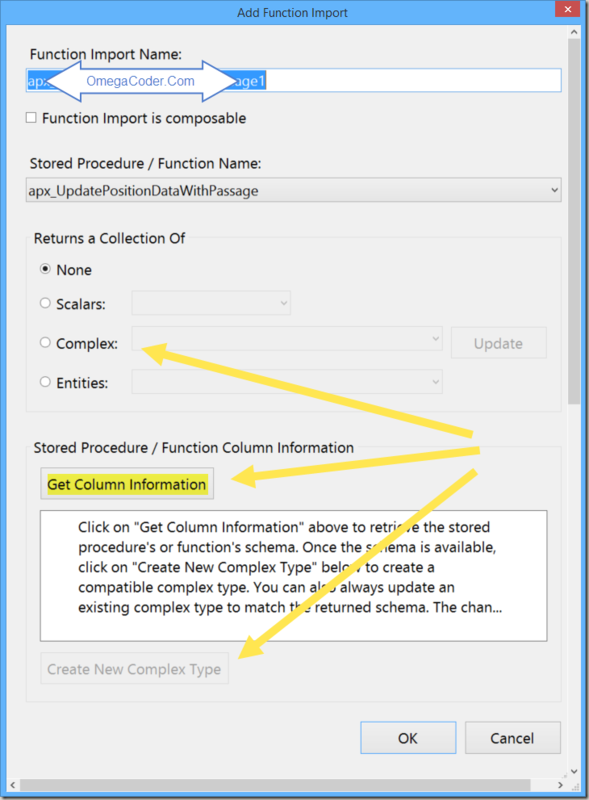 (3) If EF was able to determine the *result set entity* it will most likely be in the Complex Types folder. If the mapping has gone right you should be able to call the stored proc off of the EF context in code and it will return a list of the complex type xxx_Result. If it works you will know it, but there could be problems with the mapping. One can delete at anytime the any object in the folders of 1/2 or 3 shown above and regenerate or create a custom mapping. Don’t be afraid to delete. Sometimes very complex stored procs will not divulge the right mapping of the entity in the result set and the resulting complex type will cause failures. One way around that is to create a faux data return in the stored proc which leaves no ambiguity for Ef. In the database change the stored proc as follows. Comment out the meat of the result select and replace it with a one-to-one column stub faux select such as this example: “SELECT 1 AS ResultId, ‘Power1’ AS GroupName, ‘Test’ AS Description”. Note to be clear you will need to match every column and name. In EF’s Model Browser delete all things associated with the stored proc in folders 1, 2 and 3 above. Regenerate all by usingUpdate Model From Database. If the above steps fail one can always create a function mapping by hand. Be careful not to create duplicates, if so delete all and start over. One can get the column information, change items on the above screen; it is trial and error. You will need to play around with this until you have the right columns for your function import. Be wary of numbered copiesof the complex types which may be created from the mapping. Remember to reset the stored proc back to its original state instead of the faux stub mentioned. This is another one of of my topics which I deem to be Tribal Knowledge type information. For me it seems that such information seems be known by only the privileged few. In this article I present for your reading perusal details on how to handle different state errors found in classes and arguments during debug/development activities. The premise is that such checks for object or argument correctness is only needed for development and not for production level code. By using the Conditional attribute in ones C# code such checks can be utilized for object and state correctness but not be a burden in a production program or web site. For example, and yes its a basic example, say one is writing a database layer and the requirement is that the connection string be be properly filled with with a database name a user name and a password. You happen to know that this code will be reused by others on the development staff and they will most likely fail to provide such values the first time they hook up the code. So you don’t have to go to their desks to hand hold and debug the error, wouldn’t it be nice if the object checked its own state of correctness? Once working the checks will really become superfluous and will be removed. This scenario speaks to the fact that the user has two options, or two roads to failure, of loading the values. Say it can be done either during construction or after via the exposed properties. Just ripe for someone to forget to do one or the other. For the code we will create a connection object which checks for the validity, to the best of its ability, of those values before their use, and if a problem exists throw an application exception during development time only. ValidateState(); // during Release builds. Now this example is a bit contrived, but the idea is that if one has unique business state requirements which may need to be met before an object’s operation can be used, this methodology can be used to catch all actions, but not hamper runtime operations. It obviously shouldn’t be used to catch unique runtime scenarios such as user validation, those should be handled directly and possibly not by generating an exception. In another of my series of Tribal Knowledge articles, this one discusses the basics of loading an XDocument and creating a different document from that original. There may be a need for one to remove the document type from the original XDocument in C#, or do a basic copy and this is presented here. The above achieves the after Xml which we seek, no DocType, we didn’t add it and no first node which is the comment line. I hope this little example helps. Having premade entities created during the Linq process in .Net really comes in handy. But did you know that one can extend those entities further outside of of the generated dbml file? By using the concept introduced in C# 2.0 of a partial class, where one can have business logic methods and other properties which are not generated but are none the less relevant in an Object Oriented fashion it can be achieved. As mentioned the entities are generated and nothing is worse than having the generator throw away user code placed in the generated file after a regeneration. To allow for generated and user code to coexist hand in hand was accomplished by partial classes. That is where the partial keyword is appended to a class which allows for the class to have a subset of functionality in a different code file. The generated code file resides in one file and the user code lives elsewhere in a different file allowing them co-exist. I have used this process to put validation logic on an entity. That logic was used to verify that the differing properties which the user had entered values against matched business rules. Those rules could not be entirely expressed in a database schema. It was very Handy! A user posted a question on the MSDN Forums as to how one could achieve indexing into a Linq generated class entity where each property represented a numerated indexed field. The below code shows the use of a partial class in a separate file which the user could have an index-able entity. This article discusses the use of the attribute DataKeyNames of the ListView which can hold individual IDs for each row and how when using a CheckBox and processing an individual click, to get that info during the OnChange event. That ID is not directly supplied to the OnChange event as easily as done when directly working with ListView events. That ID, specific to the actual data is needed so an can update of status can be sent to the target database item which it represents. In the code behind my dynamic Linq entity looks like this and the dynamic entity contains a NatID which is the items primary key id and it has our properties for the checkbox states for archived and exempt. The first step is to convert the sender object to a CheckBox. Once that is successful we use the NamingContainer property off of the CheckBox. That property allows us to access the parent item which is the ListViewDataItem. That is our link back to the ListView. With that we can divine the ID needed from the ListViewDataItem’s index into the DataKeys cache for that row’s ID. Once gotten we can update the database as shown by setting the Archive attribute for the Nationalities for the user selected item. When not to use the Double Type in .Net : Financial Calculations! Where did the extra 76 come in? Using decimal will fix that issue. The failure of double comes into play when thinking of fractions such as 1/3 + 1/3 + 1/3 which we all learned in grammar schools is 1. When that is represented as .3333 + .3333 + .3333 … well that equals .9999 which is not 1. Do you want to be on the losing end of that financial calculation everytime you withdrawal money from your bank? So in the future when should one use the appropriate non integer type? Decimal for Financial calculations when exactness in calculations is needed. Float is used for scientific calculations when range is more important than precision up to seven significant digits. Double to be used when the float range of seven significant figures fails and the need up to sixteen significant digits is needed.